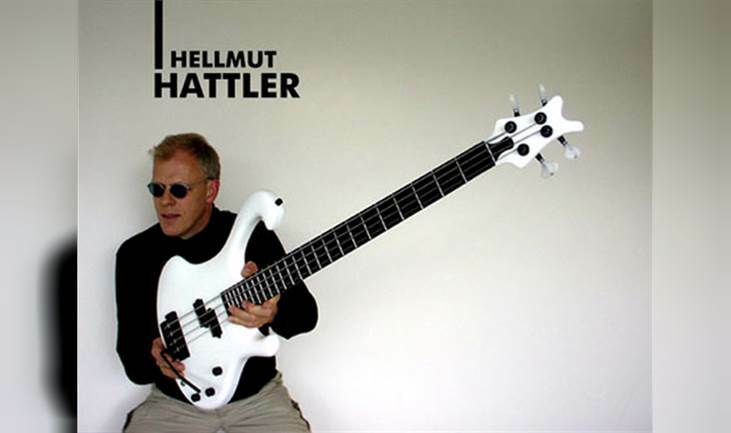 Hellmut HATTLER ?Hellmut Hattler, bass guitarist extraordinaire, composer, producer, is a living legend with a rare ability of perpetually reinventing himself. A seemingly ever self-renewing musical wellspring, he finds himself among the small and elite circle of artists who have managed to sustain great acclaim and love, yes!, on part of ever-growing audiences in the usually short-lived pop world, while never lacking unmistakable artistic identy. There may be reasons for this to be found in his vita: after years of forced violin lessons, he was ready to never touch a musical instrument again - and when he started to experiment with the bass, the instrument which should lay the foundations for his renown, it was with the firm conviction that he would never play but what came from the heart, what was entirely intuitive to him - another rare quality in the aggressively formatted entertainment industry we love to hatehate. Accordingly, Hellmut Hattler has not only stood for a distinct sound and uniquely personal, quite awe-inspiring technique for over 30 years, he has also managed to never stand still artistically and to impress the music world again and again with his creative endeavors. In the 70s, Hellmut's legendary art rock outfit Kraan was among the few successful European attempts to provide an independent-minded answer of equal merit and substance to America's jazz-rock pioneers Miles Davis, Herbie Hancock or John McLaughlin's Mahavishnu Orchestra, selling hundreds of thousands of records. In the 80s, Hellmut appeared on stages around the world and on recordings in varying all-star formations with stellar peers including Billy Cobham, Alphonse Mouzon, Brian Auger and many others. Finally, in the 90s, he was half of the internationally successful and pioneer acid-hip-jungle-jazz duo Tab Two which released 10 award-winning albums on the Virgin and Polydor labels before disbanding in 1999 after 10 years of almost constant touring, producing and composing including for pop icons such as Tina Turner. Over the last few years, Hellmut has put all his efforts into a series of releases presented plainly under the moniker 'HATTLER', again winning several awards including the Echo, the German equivalent of a Grammy. On the brand new release "The Big Flow", HH joins forces once more with renowned guitarist and community activist Torsten de Winkel in catchy and broader-than-ever melange of his much-admired electric bass guitar work with contemporary electronica, seriously soulful vocals (now by the remarkable discovery Fola Dada), ethnic quotes, and a touch of jazz "coolness" which he has established as his signature production sound over the last five years.